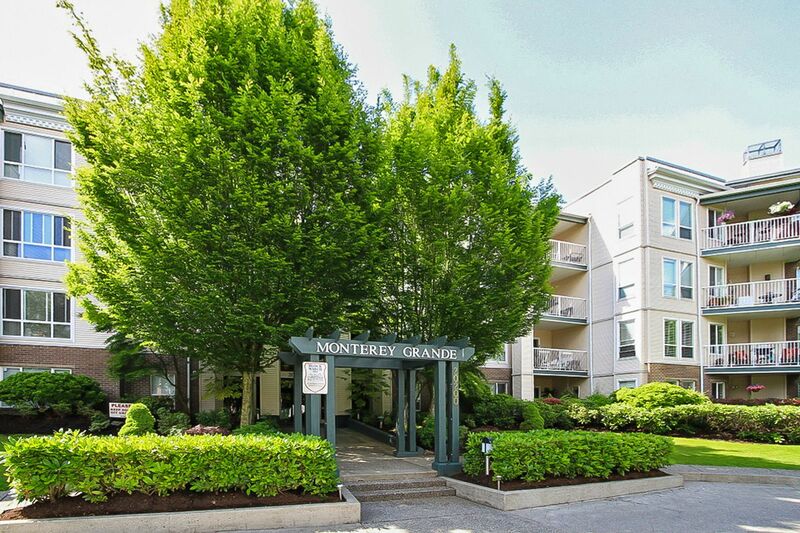 MONTEREY GRANDE - Welcome to this Spacious 2 bed, 2 bath condo with private patio. Size is not an issue in any part of this unit with a spacious open living area & kitchen, super-size master bedroom that can accommodate a king-sized bed with space to spare, walk-in closet, 2nd bedroom is also surprisingly large. Full laundry room off kitchen also doubles as storage PLUS handy storage locker right across the hallway! Updates incl: laminate, baseboards, lighting, full size top of the line washer, new garburator. Extra perks of this home incl: cozy gas fireplace, H20 & gas incl in strata fee, Rainscreened healthy building, no issues, all common areas updated. Secure underground parking, bike room & workshop. Very well-run Strata w/excellent contingency fund. Quiet area and ample visitor and street parking. Enjoy the close proximity to grocery stores, restaurants, walking trails, parks, Willowbrook Mall, Hwy 10 & easy access to Hwy 1. Book your private viewing today! !